Casino firm MegaLuck Co Ltd – the operator of the foreigner-only MegaLuck casino (pictured) on South Korea’s southern holiday destination Jeju Island – plans to launch in 2017 marketing offices in the country’s capital Seoul and in Macau. “Each office will be responsible for promoting our MegaLuck branding and new entertainment experiences through advertisements and marketing campaigns [to] enhance our competitiveness and strengthen our industry presence, thereby increasing our market share in the growing Korean and Macau tourism industry,” MegaLuck Co’s parent, Hong Kong-listed New Silkroad Culturaltainment Ltd, said in its full-year results, filed on Wednesday. “These offices will also serve as the reception points for VIP customers in Seoul and Macau by arranging tailor made travel and accommodation services for better client retention,” the firm added. New Silkroad – controlled by Beijing-based Macrolink Culturaltainment Development Co Ltd – noted that recent geopolitical tensions between China and South Korea, over deployment of a U.S. missile system in South Korea could hurt its Jeju gaming operations, by diverting Chinese tourists away from South Korea. New Silkroad is currently developing a casino resort project in Jeju called “Glorious Hill”, also to feature hotel accommodation, commercial and residential facilities, an entertainment complex, a theme park and golf courses. The project – in which New Silkroad has a 55-percent stake – is scheduled for completion in 2020 and is to be located in a land bank of approximately 1.25 million square metres (13.45 million sq feet). New Silkroad reiterated in its annual results it had formed what it termed a “strategic alliance” with gaming entrepreneur Lawrence Ho Yau Lung’s firm Melco International Development Ltd in May last year for the “provision of associated consultancy services” for its Jeju gaming operations. The firm added that Melco International had been issued with a stake of approximately 1.0 percent in New Silkroad, valued at HKD38 million (US$4.9 million), as prepayment for its services. New Silkroad owns a 72-percent stake in MegaLuck Co, acquired in late 2015 and previously named Jeju KAL Hotel; a rebranding exercise was concluded in September 2016. 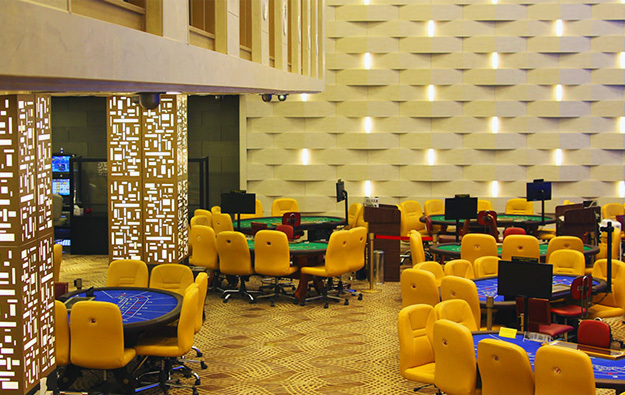 The Jeju casino offers 25 baccarat tables, two blackjack tables, one cussec table, one roulette table and 24 slot machines, according to New Silkroad’s annual report. The document stated that the operation generated gaming revenue of HKD73.0 million in full calendar year 2016 – representing 26.7 percent of New Silkroad’s total revenue for the period – and gross profit of HKD39.1 million. New Silkroad is also engaged in the production and distribution of wine and baiju – the latter a traditional Chinese alcoholic drink – in China.